The poverty and income results for 2010 came out this morning and they’re a) about what you’d expect, and b) pretty bad. Here’s some Q&A on what they show and what I think they mean, both in short-term (cyclical) and longer-term (structural) contexts. What do the numbers show, both in the short run and over the longer term? –the income of the median household, the one right in the middle of the income scale, fell 2.3% in real terms, a loss of about $1,100; median income was about $49,500 last year. –just about 50 million people lacked health insurance last year, about 16.3% of the population, which is about the same share as last year; but this steady share reflects loss of employer-based coverage and gains in coverage by a government plan. 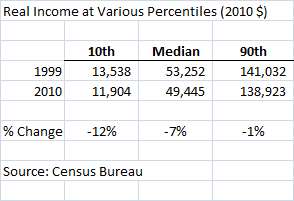 These are very rich data allowing tons of different cuts, but for now, let me just reflect on some of the income trends, as they provide a pretty fascinating look at the plight of the middle class. As I noted, the typical, or median, household’s income fell by a couple of percent last year…not unexpected given the tough job market. 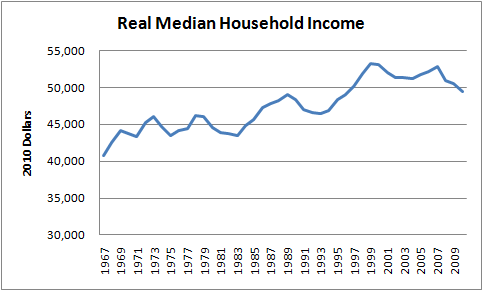 But what is remarkable and historically unprecedented is the breadth and depth of the loss of middle-class income. Since 1999, this indicator of middle class living standards has only gone up in 2 years—it rose in 2005 and 2007 (the 2006 increase was statistically insignificant). Let me underscore this point: compared to its peak in 1999, median household income is down down $3,800 (2010 dollars), more than 7%. The decline is even more dramatic for non-elderly households, those headed by someone less than 65 years old. That value peaked in 2000, and rose only 1 year since then. It’s down $6,300, or 10% since then, including last year’s decline of 2.6% ($1,500), the largest on record going back to 1987 (see chart). Economists talk about the lost decade in Japan, a period where the macroeconomy stumbled along for years. 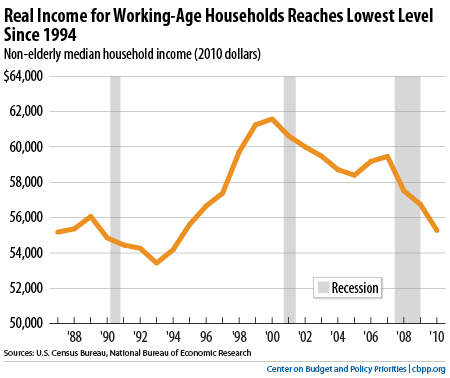 Well, with these 2010 data, we can confirm the lost decade for the American middle class. Though the economy grew most of these years in GDP terms, and productivity growth was notably robust, the middle class fell behind. The data also show that in 2010, the bottom 40% of the household income distribution now hold the lowest share of household income on record (11.8%), with data back to 1967. The top fifth has held at least 50% for the past three years. What does all this tell us about how the American economic model has worked for the middle class and the poor? –if you cut taxes for the most wealthy, the benefits of their increased economic activity will trickle down, enriching the rest of the society. –if you deregulate financial and labor markets, you will unleash innovation, investment, demand and again, the benefits will trickle down to the broad middle class and the poor. –these markets will self-regulate—the inherent incentives in the deregulated system are all that’s need to ensure the best outcomes for everyone. –gov’t interference in any of this, from unemployment insurance to labor standards to safety nets, will only serve to dampen innovation and broadly shared wealth creation. Well, based on these results, not to mention the fallout from the Great Recession that was very much an outcome of that economic experiment, it is fair to say that from the perspective of the vast majority of Americans, the experiment has been a devastating failure. First, we must have countercyclical measures to protect the most vulnerable among us, those least able to withstand the loss of income or health care coverage, from the economic storm. Today’s results deeply underscore the need for countercyclical policies like Unemployment Insurance, nutritional assistance, and publically-provided health-care coverage (see here for CBPPs analysis of this point). The second critical role for gov’t here is to help offset the contraction in private sector demand, with temporary measures to help people get back to work. In case we needed another reminder, these results underscore urgency of passing the jobs measures the President recently introduced. Those are, of course, temporary measures meant to further offset the impact of the Great Recession—to pick up where the Recovery Act left off. These are cyclical measures. As such, they are warranted and important. But as the income, poverty and inequality results of the last decade reveal, we have a structural problem that needs to be addressed. Otherwise, we could lose the next decade as well. Share the post "The Lost Decade for the Middle Class"
18 comments in reply to "The Lost Decade for the Middle Class"
Love that top chart. I’ve used that data, putting a bit more information on it, most recently in the top entry in my new blog. Your bottom table also got into that blog entry in a somewhat different form. The points in your entry are crucial to get out to as many people as possible. Keep it up! Thanks for this. Will definitely send around. The more I think and write about this, the more convinced I am that neoclassical economists (in the past and today) cannot take this step; their faith in the markets is too foundation to their thinking to be overcome. Thank you Jared. The label I have been using lately for our economic condition is “The Great Income Crash.” And I think the third column in your last chart indicates why our political class and opinion leaders have been so slow to figure out what what is going on. They aren’t feeling the hammer personally. 1.04 million fewer people employed in the private sector after 11.5 years of tax cuts and deregulation. Under ‘where does this leave us’, I would submit that it still leaves us in a culture that claims private sector endeavors are the sole creators of wealth. That allows some to demean government initiatives and claim that government is always inept. This circular reasoning has not yet been fully discredited. If we have had 30 years of neglecting the infrastructure, letting what we have decay and falling behind other advanced countries, then why should the Federal job-creation intervention be exclusively temporary? I would argue that, between the collapse of real estate which will not recover as a jobs engine for many years and the massive decline of engineering which appears to be virtually permanent, many Americans despair of seeing any light at the end of the tunnel. Remember that well before the financial collapse, the Bush “boom,” such as it was, was the “jobless recovery,” with the employment-to-population ratio at its peak well behind the highest rate in 2000. Many Americans had a sense that we were going through a real estate bubble — despite the best efforts of Republican propagandists posing as economists — and that what employment growth we had was arising from that bubble and was artificial. Despite headline unemployment below 5%, consumer confidence never came close to what it had been. What will take the place of these sectors for the long haul? Without a sense of how these holes will be filled for the long term, temporary jobs, while certainly necessary as a big part of a recovery package, will not provide the light at the end of the tunnel. A temporary employment prgram won’t by itself restore the confidence that was just beginning to solidify before Bush changed the direction of the country to favoring the wealthy. We will not have a real recovery until the sense is restored that the economy is capable of providing full employment. Two BLS economists in 2004 estimated 800,000 additional jobs would be generated by an additional $41 in infrastructure spending. Is it inconceivable that we could generate 3 to 4 million jobs — enough to be a game-changer — with $200 billion in infrastructure investment? Do we actually need that kind of investment to catch up with other leading countries? Would it be useful to society, make for a better country. Yes, it will be a while before some projects can start maximizing employment, but the promise of a continuing stream of non-outsourceable, high-paying jobs — with special help for the construction workers disproportionately thrown out of work by the real estate bubble collapse — combined with immediate and generally more temporary jobs, will bring us out of the national funk that has Americans being more careful than they even want to be with what money they have. It will need a sell job, too — both highly informative and persuasive, to enlist the American public in pushing to modernize the country. They will have to have a basic grasp of the theory behind it: filling the hole we’ve allowed to get bigger and bigger for 30 years. Making it into a public movement will not be an overnight one-speech-followed-by-few-captive-audience-town-halls effort. It could be the central part of a campaign to get a Congress that understands what needs to be done — i.e., get the worthless Republicans out of there. It would be nice, too, for the Administration to give full-throated commitment to “full employment” as its Job No. 1. Maybe some day, too, people will actually read the name of the Humphrey-Hawkins Act, stop talking about the “dual objective” of the Fed, and recognize that full employment was first and foremost in the Humphrey-Hawkins legislation that governs the Fed’s mission — stated twice before any other goal, with the other goals, important as they are for preserving the value of our money, being subservient to that primary goal: everyone who wants one should be able to find a job. I don’t know that I would have said that the data provide a “fascinating” look at the plight of the middle class. Hideously depressing, perhaps; fascinating, not so much. Did any of these really rise to level of “economic hypothesis” or were these really more theologically based experiments? Now that the experiment has been run and 90% of the guinea pigs are considerably worse off than they would have been without it, how do we hold these pseudo-scientists accountable? Isn’t it about time we find a way to tie the acquisition and maintenance of enormous amounts of wealth and income to the success of our country as whole and not let it continue unimpeded to the detriment of the country? Maybe there wouldn’t be such a rush to move jobs offshore and undermine the government and its bothersome regulations if there were a real cost of doing so. We formed an hypothesis, ran the experiment, observed the outcome, and got a clear result. The fact that the answer was “the hypothesis is false” does not make this a failed experiment. What makes it a failed experiment is that so many people in power have chosen to ignore the result, and continue to act as though the hypothesis were true. Worse, deride those people who assert that it isn’t. We should all be thinking of different ways to publicize graphs such as these: T-shirts, notebook covers, graffiti, billboards, sky-writing. But isn’t part of the problem rampant mathematical illiteracy among the American public? Plus, there’s the text behind the graphs, regarding your “experiment.” As we’ve seen, right-wing propaganda is surprisingly effective in convincing people that black is white. I wish I knew the answer. We should try everything, including prayer. But one thing is clear: we need larger and stronger unions. No one is going to give the middle class anything: they will have to take it. You miss two fundamental game changers: women entering the workforce and the internet. Your graphs don’t make clear that most households added another worker and that the revolutionary technology that is the internet was also added. Not to be a downer, but reality is a lot worse than those graphs suggest. The analysis does not paint te entire picture. There are a lot more divorces, and so single adult households now. These numbers will be s depressing as it sounds only if we normalize it to number of people per household. Btw, I am not a conservative…am a bleeding heart liberal. Just pointing out that this additional layer of data is required. Yet you’re willing to put SS, medicare, and medicaid “on the table”? The real eye opener is the real gain in income for the top 1% (not top 10%). They have not relatively lost less than others, they have actually gained. That what really should raise your eyebrows about our current tax policy. Dr. Bernstein, the book “Winner-Take-All Politics” by Jocob Hacker & Paul Pierson seems to provide an amazingly concise articulation of why we are dealing with these dire consequences. Do you have any criticisms of either their methodology or conclusions they draw (or that of the Piketty and Saez studies that they draw from)? Obviously you can’t publish a book length review here, but it would be great to have your input! Would you consider it “generally spot-on” or do you have some problems with the data, their interpretation of it, or the conclusions they draw? I thought the diagnosis in their book was excellent but wanted to hear more about solutions.